People create a reality that comports and fits with their worldview. Their prism determines that which they want to see and believe. People lie to themselves and force the realities of the world to fit a forced and conformed reality. Translation: It’s all a lie and everyone’s a liar. I’m in the distraction business. Just like the media. I’m the first to admit it. The consuming public is the crying baby. I jiggle keys to distract. Ironically, I distract with (not the truth per se but) an alternative view of alternative news in an alternative medium. Groovy, man. The impuissant media always distort. As ordered. 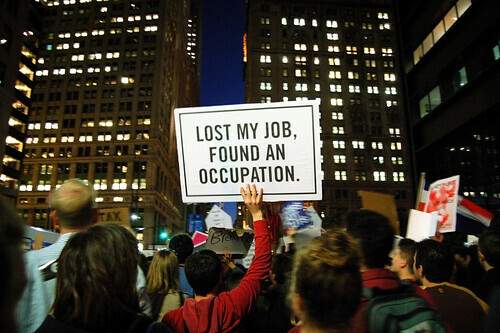 Exhibit A: #OccupyWallStreet. It seems that the corporate-controlled Ted Baxter sock puppet media have determined a priori that the protestors are baseless and foolish. We’ll see about that. So will history.